Tour of Mysore was not going that well planned the way I had planned, but sometimes some things are not in our hands. Mysore King had died the day before I landed in Mysore and it was state mourning for 3 days, most of places either without any visitors which was good thing for me, specially seeing the population status of India or some places were closed. I have always kept a separate sheet of paper, carrying the name of places which I want to visit first in that city. 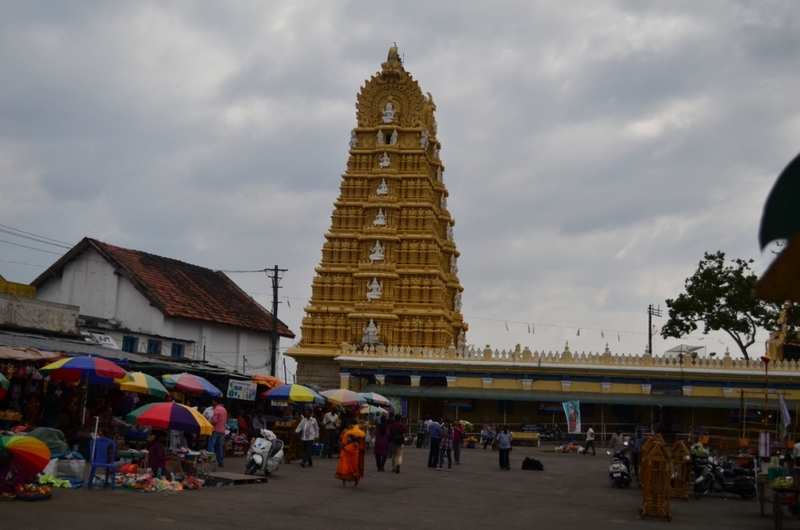 Unfortunately Mysore Palace was left unchecked that day, and the next name to come was Chamundeshwari temple of Mysore. Atlast things were going the way i wanted them to, travelling my hired auto going on bumpy ride on the steep hill of Chamundeshwari temple, 18 moving to the top from the plains overlooking Sandal wood Jungles, owned by the state government and normal public prohibited to go there, though they could sneak a view on the way going towards Chamundeshwari Temple. 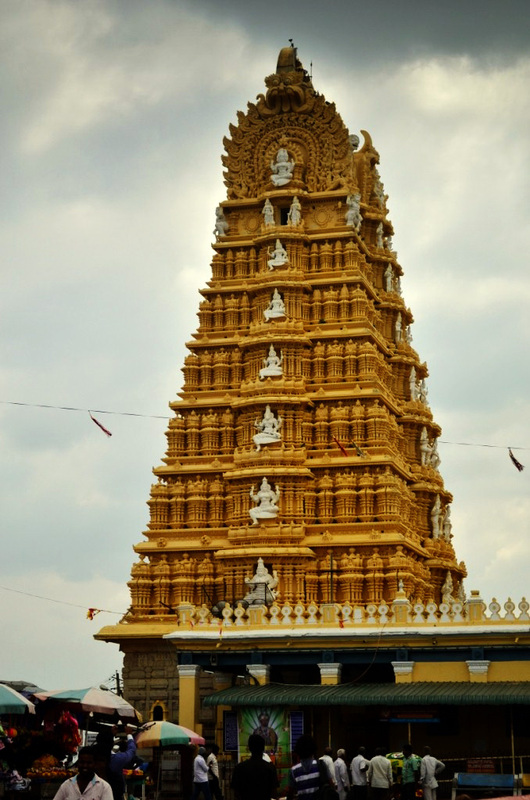 The Chamundeshwari Temple is considered as a Shakti Peetha and one among the 18 Maha Shakti Peethas. It is known as Krouncha Pitham as the region was known in Puranic times as Krouncha Puri. The origin of Shakti Peethas is associated to the mythology of Daksha yaga and Sati’s self immolation. During the Nataraj Dance by Lord Shiva carrying the remains of Sati, Lord Vishnu acting as saviour for whole humanity used his weapon Sudarshan Chakra to stop Lord Shiva, and exploded the body parts of Sati, which fell on Indian Subcontinent at 18 different places, and which are known as the Shakti Peetha today, Chamundeshwati temple is one among them. Atlast the huge structure was in front of me after that 30min ride of auto. My auto driver left us in parking and told us “Sir there would be three types of tickets to enter, you take Rs100 ticket it would make you reach fast and you would get prasad as well”, but to my surprise when I reached the ticket counter, that day was declared “Entry Free“, wow the day had started showing the good signs and Chamunda devi had started making me feel special, but some more special feelings were waiting for me. Once again My Greedy Camera was like just another luggage on the shoulder, photography inside the main temple compound is strictly prohibited. Now was the time to enter into the temple and seek the blessings. I am not that spiritual kind of guy , but I wont say that I am totally an atheist. Have been to temples in Delhi and other parts of North India, but this being my first visit to a south temple I was quite unaware of some basics rules to be followed. Unlike North, where we touch the feet of idol and seek blessings, here it was not allowed, the moment my hand went near a Lord Ganesha idol priest shouted “Do not touch”. Like my driver said, Rs 100 ticket would hurry up the things a bit, I was expecting a single separate line there, though being a Entry free day, but there was no separate line. suddenly one police man smiled towards me, said to me “No Photo’s“, I showed him the camera and said its off boss, I read the board at the main gate and it would wrong on my part if I resort to cheating ag this pious place. Don’t know what struck his mind, may be my honesty charmed him and he offered me, “want to go near the idol”, I said I haven’t bought the ticket. He said “Its ok and opened one small door leading to separate area , where only me and my wife entered and reached directly to the priest”. “Priest came to us , took the vermilion and flowers from us which we had bought outside , and came back with a yellow garland and a small sealed packet of vermilion with him. I turned my head here and there , nobody had that yellow garland hanging in their neck , then he said Namaste to us and we left the premises. I was trying to figure out what had happened inside , why they treated us like special , and i could notice this as well that anybody coming in or going out were staring to us , first towards my face and then towards the garland“. On reaching to auto my driver was smiling and looking at me and asked one simple question “So How Much Money you Gave To The Priest”, I said “Not A Single Penny, We Bought Some Flowers And Vermilion From Outside, Only That We Gave“. He stopped his auto and looked back and said “What are you saying, they doesn’t give garland even to those who pay heavy money to them“, trust me man we gave only that to them. He said “Then you are Truely lucky today sir , you have been treated special by Chamundeshwari goddess today“. Me and wife looking at each other, dumb struck, not knowing that his simple question would have such a puzzled answer. 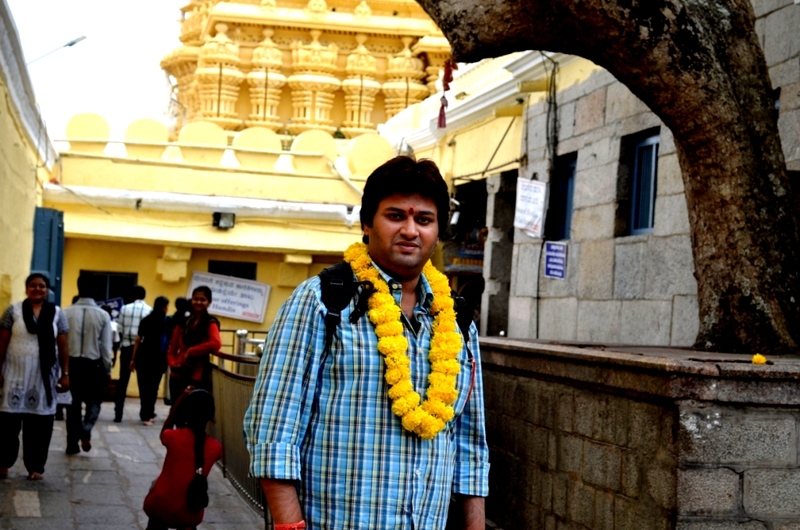 Till today while writing this piece I am thinking what happened with me that day, why I was treated like so special at Chamundeshwari temple. A Ride On Hand Pulled Rickshaw | Kolkata | Truely A Memorable Moment For Life.